Historically, the jobs of farrier and blacksmith were practically synonymous, shown by the etymology of the word: farrier comes from Middle French: ferrier (blacksmith), from the Latin word ferrum (iron). A farrier's work in colonial America or pre-Industrial Revolution Europe would have included shoeing horses, as well as the fabrication and repair of tools, the forging of architectural pieces, and so on. Modern-day farriers usually specialize in horseshoeing, focusing their time and effort on the care of the horse's hoof. For this reason, farriers and blacksmiths are considered to be in separate, albeit related, trades. In the British Army, the Household Cavalry have farriers who march in parade in ceremonial dress, carrying their historical axes with spikes. They are a familiar sight at the annual Trooping the Colour. There is also a farrier on call "round the clock, twenty-four hours a day, at Hyde Park Barracks". In the United Kingdom, the Worshipful Company of Farriers is one of the Livery Companies of the City of London. The Farriers, or horseshoe makers, organised in 1356. It received a Royal Charter of incorporation in 1571. Over the years, the Company has evolved from a trade association for horseshoe makers into an organisation for those devoted to equine welfare, including veterinary surgeons. A farrier's routine work is primarily hoof trimming and shoeing. In ordinary cases, trimming each hoof so it retains proper foot function is important. If the animal has a heavy work load, works on abrasive footing, needs additional traction, or has pathological changes in the hoof or conformational challenges, then shoes may be required. Additional tasks for the farrier include dealing with injured or diseased hooves and application of special shoes for racing, training, or "cosmetic" purposes. Horses with certain diseases or injuries may need remedial procedures for their hooves, or need special shoes. Stand Used to rest a horse's hoof off the ground when rasping the toe area. In countries such as the United Kingdom, people other than registered farriers cannot legally call themselves a farrier or carry out any farriery work (in the UK, this is under the Farriers (Registration) Act 1975). The primary aim of the act is to "prevent and avoid suffering by and cruelty to horses arising from the shoeing of horses by unskilled persons". However, in other countries, such as the United States, farriery is not regulated, no legal certification exists, and qualifications can vary. In the US, four organizations - the American Farrier's Association (AFA), the Guild of Professional Farriers (GPF), the Brotherhood of Working Farriers, and the Equine Lameness Prevention Organization (ELPO) - maintain voluntary certification programs for farriers. Of these, the AFA's program is the largest, with about 2800 certified farriers. Additionally, the AFA program has a reciprocity agreement with the Farrier Registration Council and the Worshipful Company of Farriers in the UK. Within the certification programs offered by the AFA, the GPF, and the ELPO,all farrier examinations are conducted by peer panels. 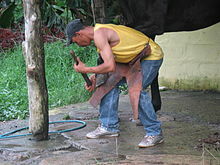 The farrier examinations for these organizations are designed so that qualified farriers may obtain a formal credential indicating they meet a meaningful standard of professional competence as determined by technical knowledge and practical skills examinations, length of field experience, and other factors. Farriers who have received a certificate of completion for attending a farrier school or course may represent themselves as having completed a particular course of study. Sometimes, usually for purposes of brevity, they use the term "certified" in advertising. Where professional registration exists, on either a compulsory or voluntary basis, a requirement for continuing professional development activity often exists to maintain a particular license or certification. For instance, farriers voluntarily registered with the American Association of Professional Farriers require at least 16 hours of continuing education every year to maintain their accreditation. ^ Household Cavalry Info site, Farriers section. Accessed 20 March 2012. ^ Audrey Pavia; Kate Gentry-Running (4 February 2011). Horse Health and Nutrition For Dummies. John Wiley & Sons. ISBN 978-1-118-05232-7. ^ Feb 5; Pets | 0 |, 2019 | (2019-02-05). "The Value Of Proper Hoof Care". San Tan Times. Retrieved 2019-04-10. ^ J. Warren Evans (13 December 2000). Horses, 3rd Edition: A Guide to Selection, Care, and Enjoyment. Henry Holt and Company. p. 314. ISBN 978-0-8050-7251-8. ^ Dave Millwater (19 October 2009). The New Dictionary of Farrier Terms 2. 7. 2-PB. Lulu.com. p. 39. ISBN 978-0-557-15559-0. ^ Cherry Hill; Richard Klimesh (2009). Horse Hoof Care. Storey Pub. p. 78. ISBN 978-1-60342-088-4. ^ Andrea E. Floyd; R. A. Mansmann (2007). Equine Podiatry. Elsevier Health Sciences. p. 413. ISBN 0-7216-0383-1. ^ "Getting More Out of Your Hoof Nippers". ^ "A Valuable Diagnostic Tool When Properly Used". ^ "Why Rasps are the Most Important -- Yet Most Neglected -- Tool in your Shoeing Box". ^ "The American Farriers Association". Americanfarriers.org. 2011-04-28. Retrieved 2013-05-11. ^ "Farrier Accreditation". Archived from the original on 2016-10-28. This page was last edited on 10 April 2019, at 22:27 (UTC).